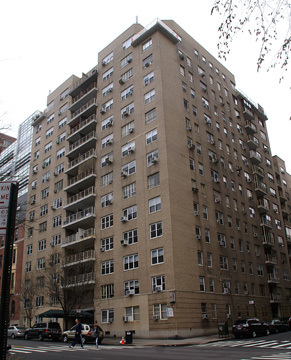 This 14-story apartment building occupies a prime site across from Carl Schurz Park on the southwest corner of 85th Street at 110 East End Avenue. It is across 85th Street from the very luxurious and elegant and older 120 East End Avenue and it is adjacent on the avenue to the very prestigious Chapin School, a private school for girls. The beige-brick building. which has a doorman, was designed by Hyman Isaac Feldman in 1951 and is notable for the delicate balcony railings with diagonal patterning in the center of its avenue frontage above its canopied entrance. The balconies protrude a bit from the rest of the facade making the handsome railings even more visually pronounced and the overall effect quite remarkably demonstrates that a little design "touch" can easily transform a boxy, uninteresting building design into something considerably more elegant. Here, the balcony railings are not only the building's "highlight" but its main focus and detract attention from the building's otherwise pedestrian elements. The building, which is also known as 540-556 East 85th Street, permits protruding window air-conditioners but fortunately retains its multipaned windows that also lessen the buidling's "heaviness." 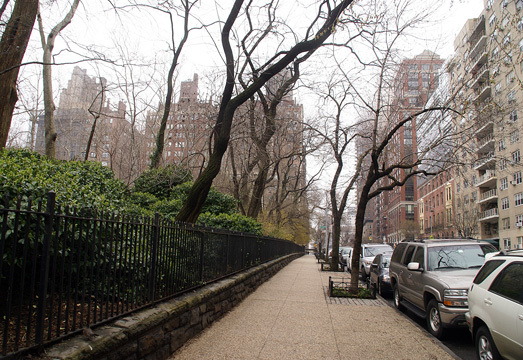 There is very little traffic on the avenue and the main entrance to the attractive park is just one block to the north at 86th Street, which is a major crosstown street although the nearest cross-town bus stop is at York Avenue. The building has about 140 apartments. Mr. Feldman was quite a prolific designer of apartment buildings in the city including many Art Deco ones in the Bronx including the "Flatiron" one at at Mount Hope Place at 1882 Grand Concourse. Among his many apartment buildings in Manhattan at the Revere on East 54th Street, the Parker Towne House on Sheridan Square, 200 East 78th Street, 201 East 77th Street, the John Adams at 12th Street and Avenue of the Americas, 799 Park Avenue, 1025 Fifth Avenue, 200 East 57th Street, 10 West 15th Street, 36 East 36th Street, 135 East 71st Street, 130 East 59th Street, 110 East 36th Street, 121 East 72nd Street, and 10 and 80 East End Avenue. "Gregory Shalette, Harvard graduate and would-be lawyer, was studying for the bar exam in his Upper East Side building on Friday afternoon when he heard glass breaking in his sister's penthouse apartment, next door to the one he shares with his father and mother. He thought it was a maintenance man, he said. He soon found out that he was wrong. As Mr. Shalette, 26, went to investigate the noise, he stumbled onto an armed burglar in the act of breaking into the top-floor apartment at 110 East End Avenue, not far from Gracie Mansion. For the next five minutes or so, Mr. Shalette, his mother and his father were held at gunpoint as the burglar made off with more than $20,000 in jewelry from their own home. The police said yesterday that the burglar had somehow slipped past the doorman of the 14-story building, made his way to the roof, dropped down onto a patio and broke into the apartment. The burglar remains at large, and investigators are trying to determine if he was involved in a similar incident on Wednesday at a building at 219 East 69th Street. For Mr. Shalette, the ordeal began when he entered the front door of his sister's apartment to investigate the noise and found a silvery revolver pointed at his face. 'It was so shiny,' he said, 'you could see your reflection.' The man - whom Mr. Shalette described as tall, lanky and wearing sunglasses, a white shirt and black pants - started yelling: 'Give me your gold! Give me your gold,' Mr. Shalette said. Mr. Shalette was stunned. 'When you have a gun pointing in your face, fighting back is the last thing on your mind.' By this time, Mr. Shalette's mother, Marilyn, 65, had stepped into the hallway that separates the adjoining penthouses. At gunpoint, the man forced her and her son back inside their apartment, and took them to a bedroom where Mr. Shalette's father, Benson, a former physician at the nearby Chapin School, was sitting. 'I want that,' Mr. Shalette quoted the man as saying. That, as it happened, was Benson Shalette's $45 wristwatch. As the burglar forced them into another bedroom in search of further loot, Mr. Shalette said, he passed by two more watches, each worth $3,000 or so, without noticing them. In the second bedroom, Mrs. Shalette handed the burglar some of her belongings, which he shoved into a cloth gym bag with his gloved hands, Mr. Shalette said. In a dresser, the burglar discovered the mother lode: a cache of antique jewelry worth about $20,000, he said. The Shalettes' Norwich terrier, Monica, had begun to bark. 'You better shut that dog up, or I'll shoot it,' Mr. Shalette said the burglar threatened. Within moments, he shut the family in the bedroom and fled. Coincidentally, Mr. Shalette had been studying the various legal counts of robberies when he was interrupted. 'I got a firsthand demonstration,' he said." It must have been a relatively "slow" news day, but the building did figure a couple of years later in a more prominent "real estate story" when the adjacent Chapin School decided to expand by adding floors to its very handsome, Georgian-style building on the northwest corner of the avenue at 84th Street. "If real life were more like fiction, the clash between Tom Wolfe, author of one of New York's defining novels, 'The Bonfire of the Vanities,' and Susan Cheever, the writer and daughter of John Cheever, the late chronicler of haute WASP angst, would have been more mano a mano. As it is, they are on opposite sides in a neighborhood fight over expansion plans by the Chapin School, which educates more than 600 girls in a Georgian-style building at 84th Street and East End Avenue. The issue is quintessentially Upper East Side: How far can an exclusive private school go without infuriating its neighbors? Mr. Wolfe, a Chapin trustee whose daughter attends the school, argued in January before Community Board 8 that the school needs to expand or risk losing its accreditation. The school goes from kindergarten through 12th grade and parents typically pay nearly $14,000 in annual fees. A Community Board committee voted 21 to 8 to back Chapin's bid for permission for the $10 million project. Ms. Cheever, on the other hand, is among a number of East Side residents who believe that the school is not entirely to be trusted. When it built a gymnasium in 1987, neighbors remember midnight jackhammering, klieg lights left on all night that blinded adjacent apartments and a generally haughty indifference to the neighborhood. 'It was a nightmare,' said Ms. Cheever, who lives 30 feet from the back wall of Chapin School. Mr. Wolfe did not return phone calls seeking comment. Residents were informed last month that the Chapin School wanted to add three floors to an existing building for a library, gymnasium and theater. The construction, beginning in June, would last some 16 months. Last week, Chapin went before the city's Board of Standards and Appeals, which is empowered to approve the expansion, and got an earful. Nine neighbors testified against the expansion, saying that they had received insufficient notice and that Chapin had botched relations with the community in the 1987 expansion. For its part, Chapin said it would listen hard to community concerns. Sandra J. Theunick, who became head of school in 1993, said Chapin had held three meetings in December and February at the school, each attended by more than a dozen people." "When representatives of the Chapin School, one of the city's elite private all-girls institutions, went before the local community board this month to present expansion plans for its building on East End Avenue, the head of school, Patricia Hayot, was in the audience, along with a few students. But though the board approved the proposed expansion, Dr. Hayot found herself on the receiving end of a rap on the knuckles and an impromptu civics lesson from more than one board member. Chapin's proposed expansion, which requires city approval, would add three stories to its existing red brick building, at 84th Street, providing new science labs and other facilities. But the construction would also seal off some windows along one wall of the apartment house at 110 East End Avenue, immediately to the north of the school. Despite the project's impact on the apartment house, the public hearing on the expansion, held on Sept. 13 by the land use committee of Community Board 8, was sparsely attended. Gerald Solovei, one of a handful of tenants from 110 East End Avenue who spoke at the meeting, suggested a reason for the small turnout. Notice of the meeting, he said, had been posted in his building less than a week earlier. In addition, he told the board, Chapin had held a private meeting the previous day to show the plans to some, but not all, of the tenants of 110 East End. Later in the meeting, Jane Parshall, a board member, chastised Chapin and, by extension, Dr. Hayot for their behavior. 'I just wish the school, trying to teach citizenship to these young ladies sitting behind me, would practice some citizenship itself by meeting with the neighbors of the adjoining building instead of with just a few of them,' Ms. Parshall said. 'I'm shocked,' she added. 'These independent schools require community service. They want their young ladies or young men to go out and reach out to see how the other half lives all the time. But they often don't practice it themselves.' In response, Dr. Hayot said in an interview on Thursday that the neighborhood had been invited, through the East 84th Street Block Association, to a Chapin open house in March at which the expansion plans were laid out in detail. Some residents of 110 East End were on hand, added Howard Goldman, the school's lawyer. As for the private meeting the day before the land use committee met, Dr. Hayot described it as simply an informal coffee that the school's plant supervisor shared with two neighbors: Leon Negron, a representative of the East 84th Street Block Association, and one tenant of 110 East End. 'It was five minutes of my time walking in to say hi to Mr. Negron because I hadn't seen him all summer,' Dr. Hayot said. Despite the flurry of controversy, the committee voted 19 to 16, with one abstention, to approve the Chapin addition. While a community board's role is only advisory, its votes can influence decisions by city agencies. On Tuesday, Chapin presented its proposal at a public hearing of the city's Board of Standards and Appeals, whose approval the project requires. Because Chapin is seeking only to amend a zoning variance granted in 1995 for an earlier expansion, and its plans can be carried out under the current zoning, the project faces fewer hurdles than it otherwise might."